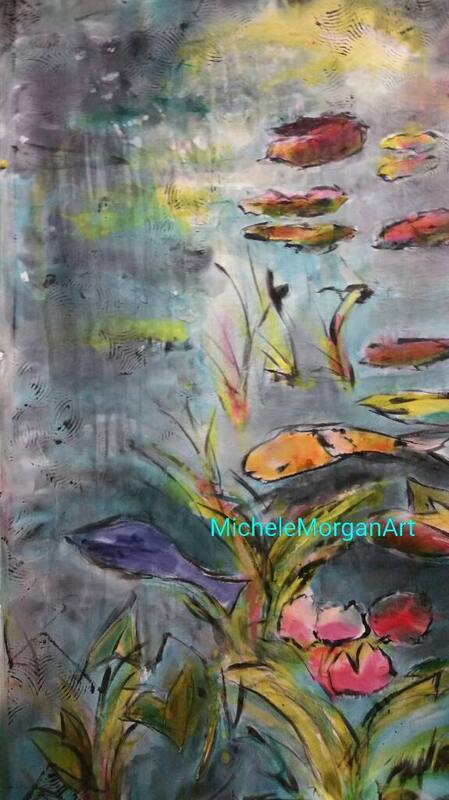 A beautiful rendition of a koi pond on silk. This is one of a kind for sure. I could never reproduce this again. It's an abstract of my own conceptual. It has the most tranquil feeling with the beautiful colors of water and the greenery. It is very. Zen. Who is the pop of Orange and hot fuchsia, it's actually a piece that can fit in having any room. It comes unframed. It is 45 by 60 inches loose silk. Your framer stretches it on a board and then you pick your frame of your choice.